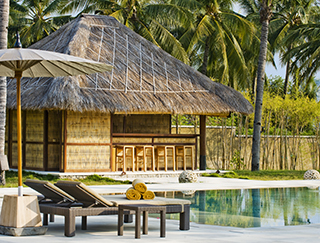 Sepoi Sepoi is a luxury six-bedroom villa set in four and a half acres of neatly groomed coconut grove bordering a fine white-sand beach and the azure seas of the Lombok Straits. This secluded villa represents a total escape from routine and the chance to relax on one of the world’s most scenic and, as yet, relatively undiscovered tropical islands. The Villa is a family home designed to delight all ages. Aside from the natural pleasures of the beach and gardens, facilities include a 20-metre swimming pool, cabana bar, table tennis, Nintendo Wii, a projector screen for alfresco movie nights, bicycles and WiFi. An efficient and discreet staff team, including a chef, villa manager, driver, housekeeping and security, will ensure you have a wonderful holiday at Sepoi Sepoi – a private beach retreat where all your needs are met with a smile. The villa is designed around a central courtyard and then develops westwards through the living pavilion to the infinity pool and beyond to the beach. The garden bedrooms at the eastern side of the courtyard back onto the villa’s own orchard. The buildings are of a traditional Indonesian style of architecture constructed of high-quality local materials. 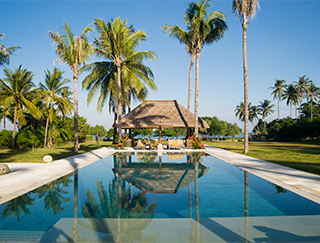 The villa’s six large bedrooms can comfortably sleep three families with children and maids. Communal areas include a large open-sided living pavilion, dining pavilion, impressive sized kitchen and media room.